For 2 cakes in spring forms or one cake in a large roasting pan. For 1 cake in a spring form (half portion). Mix the wet ingredients separately. Including the sugar. Bake at 365°F (185° C) for approx. 30-40 minutes. If you you use a large roasting pan instead of 2 spring forms you must bake it a little less time. Check the dough by sticking in a trussing needle, knitting needle, small knife, or the like. If there is no dough when you pull it out, the cake is done. Whisk the glaze together and spread it over the cake. Beat for at leat 5 minutes so it becomes light and airy. If you prefer, you can garnish with a little chopped hazelnuts. Cool down before serving. Is best the next day. The cake is also an excellent base for a wedding cake. If you use a spring form it should bake for approx. 40 minutes. If you use a large roasting pan it should bake for approx. 30minutes. If you use a fresh cheese instead of a cream cheese, you cannot whip the frosting as airy. It can also be a benefit the frosting if you whip in an egg yolk to make it creamier. 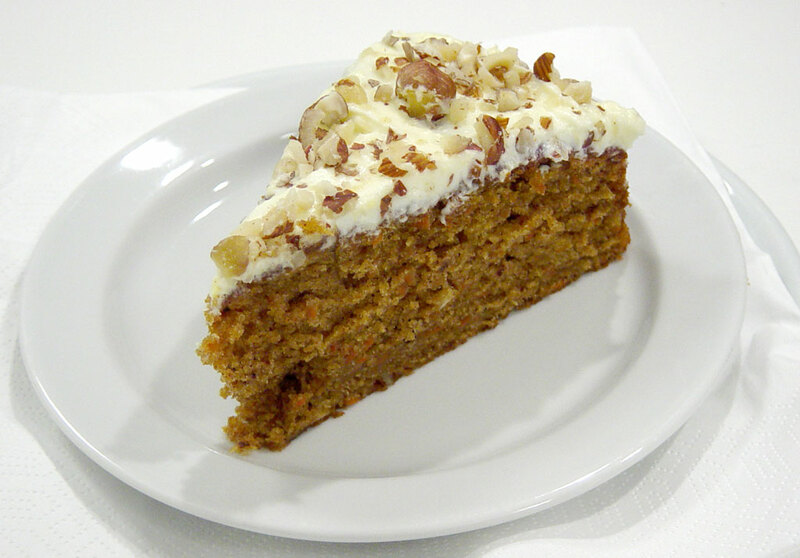 OMG, how funny is your description about the carrot cake " ...a dry and boring things that women ate, while feeling guilty." I just cannot stop laughing - I agree with you, but tell THAT to my husband - that's HIS favorite cake!! HA,HA,HA, OMG! !